This program is an upgrade of a promotion that many centers have run in the summer over the years wherein youth were provided the opportunity to bowl a free game or two a day, on certain days and in specific time segments. The centers that ran the promotion were looking to build traffic in the time segments where they commonly had idle lanes. The traffic built would result in cash sales for purchases beyond the free games and most importantly provide a way for centers to build and/or improve their databases to use in future marketing. Most centers that employed that tactic built traffic early in the summer but failed miserably in collection of good data and/or keeping the traffic coming over the summer. Kids Bowl Free® has provided centers with tools, systems and programming to not only overcome the shortfalls of the forerunner programs and has delivered beyond expectations for centers that executed the program properly before the end of school this past spring. Driven by an internet marketing structure headlined by www.KidsBowlFree.com centers collected accurate data before anyone entered their bowling center and kept traffic coming as a result of the systems automatic delivered coupons on a weekly basis. The centers went into the fall with a fresh hot database to market a whole variety of fall programs. During the summer of 2018, the Kids Bowl Free® summer bowling program registered 2,841,114 kids from over 1 million families. The Kids Bowl Free® Program has registered 21,780,000 kids in just 11 short summers. 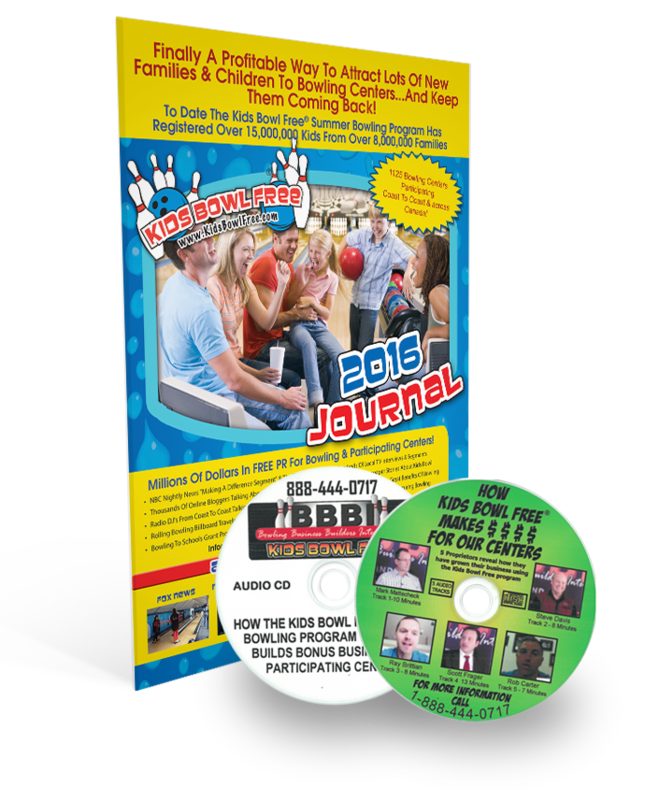 Since its inception in 2008, BBBI/Kids Bowl Free® has been helping centers generate traffic, generate cash and collect and use data all while providing children with two free games of bowling all summer long. Last year, over 1360 participating centers, throughout the U.S. and Canada, added valuable information from local families to their data bases while benefiting from fresh revenue from shoe rental, food, beverage and other categories. Copyright 2016 | Bowling Business Builders Inc.